Arrive Delhi, meet and assistance at the airport and transfer to the hotel. Overnight stay in Delhi. After morning breakfast proceed for the airport to board in fligt for Srinagar. On arrival at Srinagar, you will be met by our representative at the airport and transfer you to Deluxe Houseboat. Half-day tour of world famous Mughal Gardens visiting the Nishat Bagh (The garden of pleasure) and Shalimar Bagh (Abode of love). Overnight stay in Srinagar. Full day tour of Gulmarg, which is one of the most beautiful summer resorts in the valley. It is also popular for its golf course (in summer), the highest in the world and skiing during the winter season. Enjoy the splendor of nature and the snowy mountains. One can have Gondola ride (cable car) from Gulmarg to Khalinmarg In the evening return to Houseboat. Overnight at Houseboat. After breakfast Shikara ride on The Dal Lake to enjoy the beauty that God has graced this city with which is often compared to Venice. Transfer in time to the airport to connect onwards destination flight for Delhi later on drive for Manadawa. Arrive Mandawa on arrival assistance and transfer to the hotel evening at leisure and over night stay at Mandawa. Morning after breakfast drive to Bikaner. On arrival transfer to the hotel. Later city sight seeing tour. Bikaner is named after its founder Rao Bikaji in 1488. But long before this, the city was trade center on the caravan routes from Africa and West Asia. Bikaner's dominant features are rippling sands and abundant sunshine. The city stands on an elevation, enclosed by a 7 Kms wall, which can be entered from 5 gates. Bikaner City is bolstered by imposing walls and has a 16th century fort housing old palaces, temples and mosque. Founded by Raja Rai Singh the fort is distinguished by its long range of 37 pavilions, a line of balconies and aerial windows of varying designs. Also visit Lallgarh Palace, the museum, and Bhanda Sagar Jain and Deshnoke Rat temple. Overnight stay at hotel in Bikaner. Morning after breakfast drive to Jaisalmer, and check in to hotel at Jaisalmer, evening at leisure, night stay in Hotel. After breakfast drive to Jodhpur. On arrival transfer to hotel. Later sight seeing tour of Jodhpur, Jodhpur - the stronghold of the fierce Rathore clan, was founded in 1459 by Prince Jodha. Visit the Mehrangarh Fort, situated on a low sandstone hill. Within the fort, visit Moti Mahal and Phool Mahal. Also visit Jaswant Thada, an imposing marble cenotaph, built in memory of Maharaja Jaswant Singh II around 1899 and Umaid Public gardens. Overnight stay in Hotel. Morning after breakfast at Jodhpur drive to Udaipur, Enroute visiting to Ranakpur.The Jain Temples of Ranakpur, built in the15th century is situated in a lovely valley of the Aravalies. Its surrounding are quite and picturesque. There are 1444 pillers in the temple and none of them are similar. The magic of the light and shade is really entrancing. Surya Temple and Other temples are side attractions on arrival check -in at hotel.overnigt at the hotel. Morning after breakfast at Udaipur leave for Jaipur a Pink City of Rajasthan, enroute visiting Pushskar see a breath taking view of the Ghats & the people taking a dip in the Sarovar also visit the temple of Lord Brahma creator of the world the only temple in Pushkar wonder around the lively market of Pushkar & see the beautiful article on display reach Jaipur and over night at the hotel. Morning after breakfast excursion to Amber Fort. Elephant ride ascent to the fort. is the classic romantic Rajasthani fort palace. Its construction was started by Man Singh I in 1592, and completed by his descendent Jai Singh I. Its forbidding exterior belies an inner paradise where a beautiful fusion of Mughal and Hindu styles finds it's ultimate expression. The ornamental facade of this "Palace of Winds" is a prominent landmark in Jaipur. Their five-storey structures of sandstone plastered pink encrusted with fine trelliswork and elaborate balconies. The palace has 953 niches and windows. Built in 1799 by Pratap Singh, the Mahal was a royal grandstand for the palace women. Overnight stay in Jaipur. Morning after breakfast at Jaipur Leave for Agra Enroute visiting Fatehpur Sikri-a perfectly preserved red sandstone "ghost town" which was the estranged capital of mughal emperor Akbar, built in 1569 and deserted when its water supply failed. In evening proceed for city sight seeing tour visiting the world famous Taj Mahal, built by the Mughal Emperor Shahjehan in 1630 for his queen Mumtaz Mahal to enshrine her mortal remains and also visit Agra Fort, after sight seeing Transfer to the railway station to board for overnight journey to Varansi. Arrival at Varansi in the morning, assistance upon arrival and transfer to Hotel. Afternoon free and later evening Visit Ganga Ghat and Enjoy a Boat ride at Ganga Ghat.Transfer to hotel. 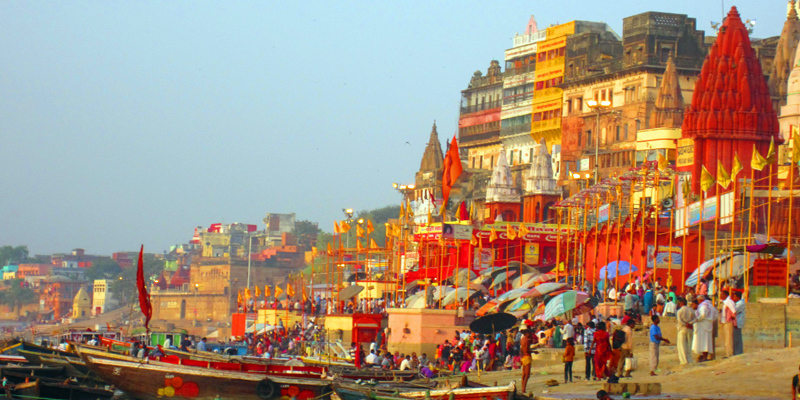 Full day Sight seen tour to Varansi, visit ancient temples and Ghat's. Varansi is one of the Holy cities of the Hindu's. Famous for its Ganga Ghat's (Bank of River Ganges). Evening transfer to the Varansi Railway station to board in train for over night journey for Delhi. OLD DELHI : A sight-seeing tour of Old Delhi would entail visiting the Raj Ghat - the memorial site where Mahatma Gandhi was cremated; Jama Masjid - the largest mosque in India . NEW DELHI : An extensive sight-seeing tour of New Delhi would include a visit to the Humayun's Tomb, the Qutub Minar, a drive along the ceremonial avenue - Rajpath, past the imposing India Gate, Parliament House, the President's Residence. OLD DELHI : A sight-seeing tour of Old Delhi would entail visiting the Raj Ghat - the memorial site where Mahatma Gandhi was cremated; Jama Masjid - the largest mosque in India .